A notice for the Community Board 6 informational meeting at 141 Conover St. in Red Hook. RED HOOK — A Fort Greene nursing home is planning to move its operation to a brand new 200-bed facility in Red Hook, attorneys said. Oxford Nursing Home, currently located at 144 South Oxford St., will be “closed and replaced” by a to-be-constructed building at 141 Conover St. in Red Hook, according to Jerome Levy, an attorney for the project with Duane Morris. The new nursing home will hold 200 beds and will be “much more modern than Fort Greene,” he said. Construction is expected to begin late 2016 to early 2017. The L-shared property, bound by Van Brunt, Conover, Sullivan and King streets, occupies about two-thirds of the block and is owned by Oxford Nursing Home under the name Conover King Realty LLC, according to city records and attorney Howard Weiss, of Davidoff, Hutcher & Citron, who will be representing the nursing home for the property’s rezoning. The roughly 38,000-square-foot plot of land is currently zoned for manufacturing but Oxford is seeking a zoning map amendment, zoning certification and special permit that would allow them to build the nursing home on the site. Oxford is looking to rezone the entire block to a Special Mixed Use District (MX-5) that sanctions residential as well as light manufacturing on the property, Weiss said. “In order to develop a nursing home, we need that residential zoning district component,” he explained. Oxford Nursing Home’s current building on South Oxford Street was constructed around 1930 and was later converted to a nursing home. The building however does not meet the state code for a modern nursing home and Oxford was asked to find a replacement “because the existing building could not be altered to bring it up to current standards,” Weiss said. Oxford is proposing to build a 138,000-square-foot, multilevel nursing home with 200 beds and a 37,000-square-foot ambulatory and diagnostic treatment facility on the property. There will also be 56 parking spots on site. Weiss could not provide the cost of the project. An administrator for Oxford Nursing Home declined to comment immediately. The nursing home will serve both residents of the center and offer “a range of outpatient services of the local community,” Weiss said. Along with the zoning amendment and certification a special permit is needed to lift a cap on the buildable floor area. The Fort Greene center will close once the Red Hook site is complete and about 130 existing employees will be moved to the new space. Oxford will add on another 100 employees and has committed to hiring locally as well as working with neighborhood businesses, Weiss said. The proposed Red Hook facility will however be slightly smaller than the current Fort Greene one, which has 235 beds. Weiss said the nursing home plans to begin downsizing to 200 beds in the coming year. The project still must go through a formal ULURP process with the community board and city before construction can begin. An informational Community Board 6 meeting is scheduled for Thursday in Red Hook so local residents can learn more about the plan. 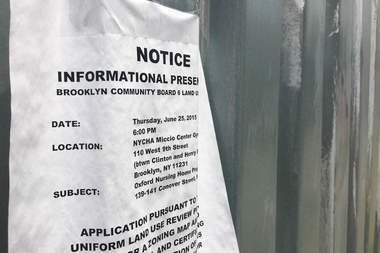 “We felt it was important to come before the community board at an earlier stage to discuss the project and hear any concerns that might exist,” Weiss said. The meeting will take place 6 p.m. on June 25 at the Miccio Center, located at 110 West Ninth St. in Red Hook.